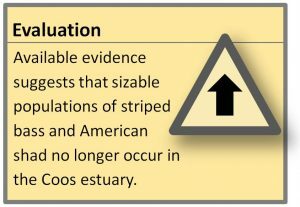 Monitoring of striped bass and American shad in the Coos estuary have largely been suspended since populations of both non-native fishes has sharply declined since their height in the 1940s and 1950’s. 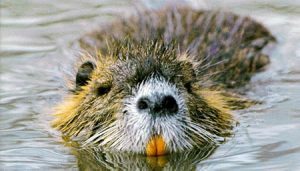 Invasive nutria cause substantial economic and ecological harm to coastal communities. All indications suggest populations are strong in the project area. Figure 1. 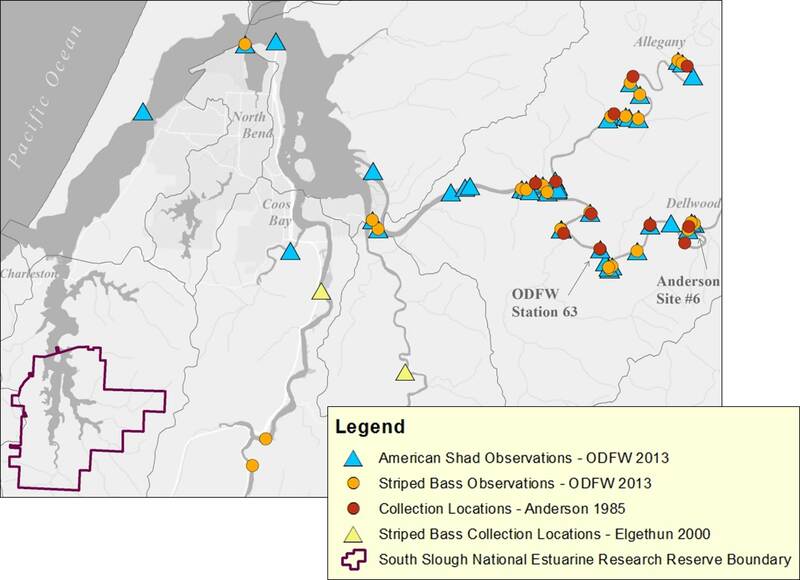 ODFW’s American shad and striped bass data collection sites. Figure shows fewer sites than were actually sampled since not all ODFW sites included lat/long information. sites were missed at different years). intermediates and adults were also caught. Sloughs. Small numbers (<10) of shad were found each year. one large rodent, nutria (Myocastor coypus). in southwestern Oregon (Rothman 1968). point that the run does not occur every year. 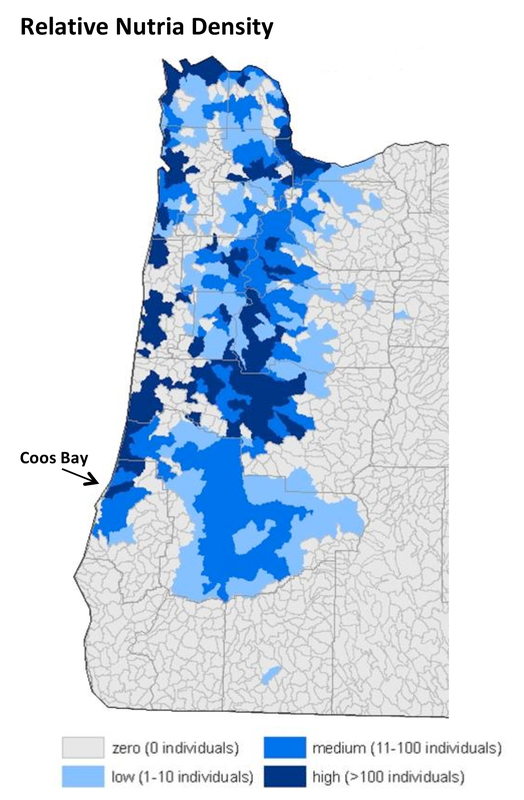 still exists for shad in the Coos watershed (G.
recent years (Hasselman et. al. 2012b). are still recorded when caught. to a location outside its native range. or causes significant economic loss. study of the South Slough estuary. 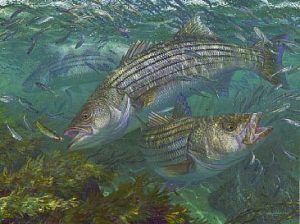 Between July 2015 and June 2016 only 15 American shad have been caught. in the Columbia River, (Hasselman 2012b). striped bass were caught in the Coos estuary. bass breeding population on the west coast. 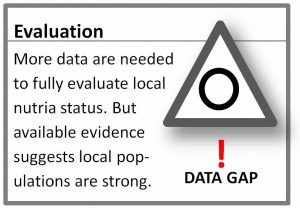 effort and catch data)(G. Vonderohe, pers. fishery having closed years ago. (1992) at 40 μg/kg and 50 μg/kg respectively. Like salmon, American shad are anadromous. to the ocean (Monaco and Emmett 1990). dam fish ladders (Hasselman 2012a). of the parasite into freshwater systems. from: Sheffels and Sytsma 2007.
can range as high as 56 animals per acre. Bay along the North Spit (USGS 2015). short-lived industry with lasting consequences. pets (e.g., rabies)(Witmer and Lewis 2001). wetlands in South Slough (Cornu, pers. com. Elgethun K, C Neumann, and P Blake. 2000. USA)”. Chemosphere. 41 (7): 953-64. Hasselman, D. J., R. A. Hinrichsen, B. A.
Shields, and C. C. Ebbesmeyer. 2012a. Pacific Northwest.” Fisheries. 37(3): 103-114. Moyle, P. B. 2002. Inland Fishes of California. (ODFW). 2009. [Coos Bay spring gillnetting]. 74.” Marine Fisheries Review. 40(1): 18-20. America.” Fishery Bulletin. 109(4): 440-453. (MS) – Oregon State University. Waldman, J. R., R.E. Bender, and I.I. Wirgin.